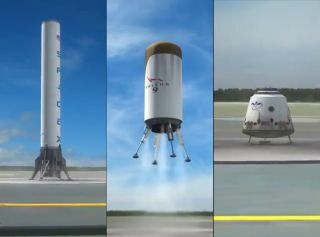 These three stills from a SpaceX video depict the three components of a planned fully reusable rocket launching system, including a first stage (left), second stage (center) and crew capsule. This story was updated at 5:57 p.m. EDT. The private spaceflight firm SpaceX will try to build the world's first completely reusable rocket and spaceship, a space travel method that could open the gates of Mars for humanity, the company's milionaire CEO Elon Musk announced Thursday (Sept. 29). A fully reusable rocket would dramatically decrease the cost of lofting cargo and humans to space, making the exploration and colonization of other worlds such as Mars more feasible, Musk said in a speech at the National Press Club in Washington, D.C.
"We will see if this works," Musk said. "And if it does work, it'll be pretty huge." The hunt for an economic and reusable method for space travel has been a goal of many companies and government agencies from the Space Age's inception. The only reusable manned spaceships built to date have been NASA's winged space shuttles, which were retired this year. The shuttles used reusable orbiters and solid rocket boosters for 30 years, but the system was not completely reusable. Each of NASA's 135 shuttle missions also used a disposable 15-story external fuel tank. The tank was jettisoned once a shuttle reached orbit and ultimately burned up during re-entry. Musk has said repeatedly over the years that he founded SpaceX in 2002 with the primary goal of helping humanity establish a lasting presence beyond Earth. Such expansion is necessary to ensure our species' survival, according to Musk, since a catastrophic asteroid strike or other calamity could one day wipe out life on our home planet. Mars is a prime candidate for human settlement, and Musk has said he hopes SpaceX can send astronauts to the Red Planet within 10 or 20 years. Colonizing Mars — or any other world — would require ferrying thousands of people and millions of tons of cargo through space. That's just not feasible with today's launch costs, Musk has said. But a fully reusable rocket could change the equation dramatically. Musk illustrated the point by citing SpaceX's Falcon 9, which costs between $50 million to $60 million per launch in its current configuration. A heat shield protects the second stage of SpaceX's planned fully reusable rocket during its re-entry through Earth's atmosphere in this still from a SpaceX video. The second stage rocket, like SpaceX's first stage, would make a vertical landing at its launch site. In its video new animation, SpaceX officials detail how their new launch vehicle, which is based on the Falcon 9 rocket, would work. After separating in orbit, the two stages of the rocket would come back to Earth and land at the launch pad. The stages would not glide back using wings like the space shuttle; rather, they'd descend vertically, eventually settling down on four legs. They could then be refueled, reintegrated and relaunched. In the video, the Falcon 9 launches SpaceX's Dragon capsule to the International Space Station. NASA has contracted the company to make cargo flights to the orbiting lab. Falcon 9 lofted Dragon to Earth orbit for the first time last December, and SpaceX had been planning to launch a demonstration mission docking Dragon to the station in January 2012. SpaceX officials announced late today (Sept. 30) that the firm could be ready to launch the next Dragon test flight by Dec. 19, but that target is still awaiting review by the U.S. Air Force and NASA. Whenever that demo launches, if all goes well, Dragon's next flight would be an operational cargo mission to the space station, SpaceX officials have said. Dragon is also designed to be reusable, and SpaceX is modifying it to carry crew as well as supplies. The company hopes NASA eventually uses Dragon to launch its astronauts to low-Earth orbit. The country has lacked this capability since NASA's space shuttle fleet retired in July and currently depends on Russian Soyuz vehicles to provide this taxi service. Musk did not say when he hopes the reusable rocket would be operational, or how much its development would cost. But SpaceX is going to give the enterprise its best shot. "We have a design that on paper — doing the calculations, doing the simulations — it does work," Musk said. "Now we need to make sure those simulations and reality agree because generally, when they don't, reality wins."